I’ve been spending my spare desktop computer cycles mining for the latest hot commodity, DogeCoin. I’m lucky that the graphics card I already have is a pretty good miner already, the 7750 from MSI. Pushing only about 80% as hard as I could, I’m getting a steady 150 kh/s, building my fortune at a rate of about 1000 coins every 24 hours. The going rate for a grand of Ð? About $1.30. Sure that doesn’t sound like much, but it’s a sizable chunk of my daily rent cost of $8.33, which includes the electricity that powers the miner. I didn’t expect that when I started mining for Ð that I would start assembling BAT files, using the windows console POWERCFG utility, tweaking processor core temps and fan speeds, or managing python libraries and scripts. I’ve learned more about computers in the last 24 hours than I have over the past 12 months and I’ve had a blast doing it. DogeCoin doesn’t take itself too seriously. Which is for the best, considering that cryptocurrencies like Bitcoin and DogeCoin are still a massive unknown. If you take it too seriously, you might invest a lot of your time and money into something that ends up evaporating like fog on a sunny day. Keep it light and keep your expectations low, and you’ll be better off no matter what happens. You need a few things to start mining. A computer. Any computer will do but newer, better ones mine far better. A Doge Wallet. This holds your coins. I use the desktop version 1.5 because it’s more secure than an online wallet. Membership in a mining pool. This is free and anonymous and you can get set up in a couple of minutes. I use rapidhash. Once you are logged in you will need to create a worker for your mining utility to “log in” to. A mining utility. This is by far the most complicated part of your setup. 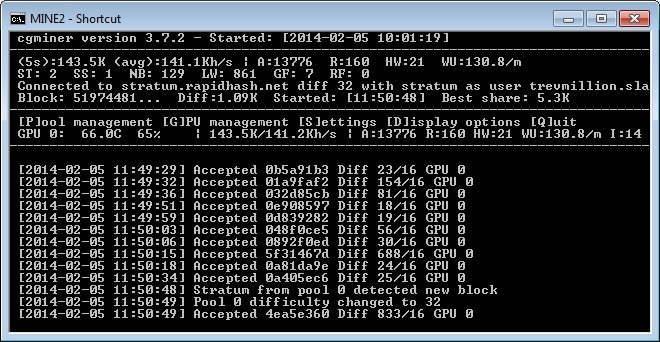 If you have a good graphics card based on AMD you will want to use cgminer 3.7.2 (not the newer versions). If you have a geforce graphics card you will need to use cudaminer. If your graphics card is deficient or non existent, you can use cpuminer instead but your mining speed is almost always faster with a graphics card than with a CPU. There’s a full list of graphics cards along with recommended utilities at litecoin.info. Mining is done in a little terminal screen and set up using essentially an MS dos prompt. Fortunately the mining pool I recommended RapidHash makes a windows BAT file for you that sets everything up automatically. Can I Still Use my Computer While Mining? I did this entire article while my graphics card plugged away full tilt mining DogeCoin. I was also running a Dwarf Fortress at its full complement of FPS. Since the best mining method does not use the CPU, only graphic intensive tasks that use the graphics card are affected. That includes photoshop, youtube videos, and video games. Even the animated gif I used up above is much choppier than usual while mining. Will Mining Hurt my Graphics Card? It sure will if you let it get too hot. This rules out mining with most laptops because their airflow is so limited that they can’t handle the heat. Most miners try to keep their graphics card temperatures at 80°C but I like to keep it at a much more conservative 65°C. I find the best way to keep the card cool is by manually setting the fan control higher. Usually you will have to install the specialty software your graphics came with to adjust your fan controls. I found this useful tutorial on building a 500 kh/s rig for 300$. Considering I’m happy to pay 1$ per kh/s, this is a pretty good deal. US prices. This entry was posted in Computers, Nerd Finance, Passive Income. Bookmark the permalink.